Eleven lives lost. Five millions barrels of oil spilled into the sea. $27 billion spent so far by BP in fines, economic claims, disaster response efforts, and clean-up and restoration programs. And no independent, confidential reporting system for staff to use in the oil and gas industry. This last fact is by no means irrelevant, or inconsequential. Could confidential reporting have actually helped avert the disaster? It’s been five years since the explosion at the Macondo oil rig and the subsequent environmental catastrophe in the Gulf of Mexico. But residents and activists in the area surrounding the Gulf of Mexico are still finding oil on beaches, land and in the water. There has been a suggestion from the National Wildlife Federation that up to 20 species are still affected. Last year, dolphins along Louisiana’s coastline were found dead at four times the normal rate. Some fishermen are also finding their nets are coming back empty - though this may be hard to link directly with the spill, and BP disputes the evidence, it is a reminder of the potential loss to economic livelihoods. In 2015, BP is insisting things are ‘getting better’ despite a high degree of public scepticism, and the scientific evidence refuting this view. One thing is certain: BP’s costs associated with the disaster are steadily increasing, even now, and it is clear massive reputational damage has been inflicted. No amount of carefully crafted corporate PR spin from BP can reverse the negative trajectory of events. For the time being at least, it doesn’t look as though public opinion can be shifted that much either. The recovery from a tarnished reputation is, at best, a long and painful process. BP has said its US subsidiary may even go bankrupt if it cannot afford the fines which continue to rise. It may well be perceived as preaching from the side lines, but I am persuaded that confidential reporting could have been critical in preventing both loss of life and environmental catastrophe in the Gulf of Mexico, as well as leaving BP’s reputation intact. Of course, we can’t know for sure. We can’t travel back in time and run an experiment under different conditions. There’s no way of knowing if the critical information needed to prevent disaster would have surfaced if the oil and gas industry had subscribed to confidential reporting. There are, however, reasonable grounds for thinking it could have made all the difference. The troubling symptoms of a disaster-in-the-making may well have been picked up far earlier through the mechanism of confidential reporting. In other words, there was a clear failure to instil good safety culture, and key safety defences had been steadily eroded over time, making such a disaster more or less inevitable. Unchecked failings may well have made the disaster inevitable, but this shouldn’t be equated with it being unpreventable. So how were these safety defences so effectively overwhelmed? How did the crew on the oil rig come to describe it as ‘the well from hell’, whilst BP’s Vice President of Drilling Operations said it was “…the best performing rig that we had in our fleet and in the Gulf of Mexico”? You would be forgiven for thinking they were talking about different oil rigs altogether. The oil rig crew and senior management were not only talking a different language, they were inhabiting different safety worlds. “Damn thing been in bypass for five years. Matter of fact, the entire fleet runs them in bypass”. In other words, the practice of bypassing a critical safety system was set up to be the default in many other locations too. But the catalogue of management failings doesn’t end there. There were was no procedure for running, or interpreting, what in the oil and gas business is called the ‘negative pressure test’ to show the well was safely sealed with cement. So the crew weren’t able to decipher critical data which would have alerted them to the danger signs. To make matters worse, there was no procedure for calling back to shore for a second opinion about confusing data. Finally, there was no formal training for rig the crew, especially in response to emergency situations. To my mind though, by far the biggest failing was the failure to learn from a near-miss incident in the North Sea just four months earlier. 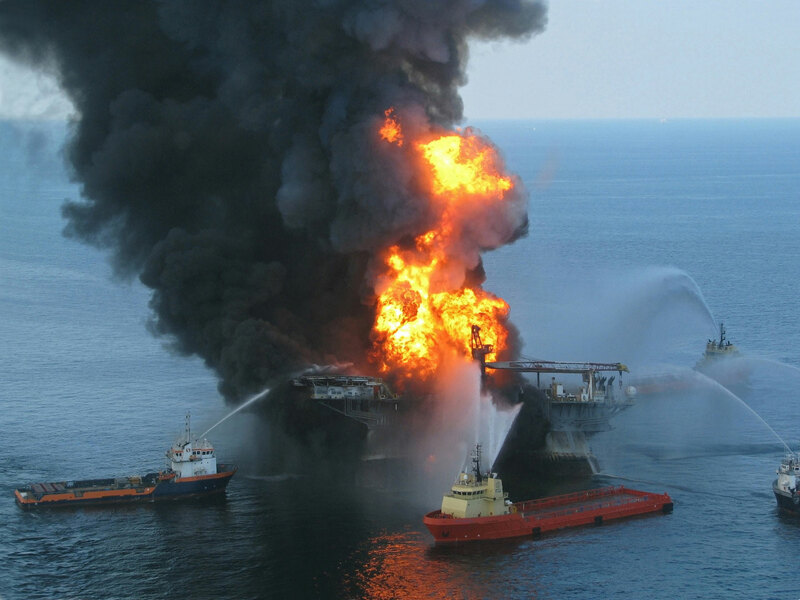 Learning from this incident (at a rig also run by BP’s contractor Transocean) also had the clear potential to prevent the loss of eleven lives and the environmental disaster in the Gulf of Mexico. The basic facts of the two incidents were essentially the same, but the North Sea near-miss didn’t reach the level of catastrophic blowout. Tragically, the lessons from the North Sea incident weren’t communicated to the crew at Deepwater Horizon. The critical learning remained frustratingly ‘locked away’ in the system. Had this learning reached the right personnel in time, it may have prevented the disaster. An ‘operations advisory’ with the critical information was sent to some of the fleet in the North Sea, and a PowerPoint presentation was created for the purposes of learning from the incident. Neither made it to the Deepwater Horizon crew. In the digital age, when all this information could have travelled thousands of miles at the touch of the ‘send’ button, this is especially difficult to accept. Creating the right environment for reporting safety issues is absolutely essential. The Deepwater Horizon rig crew were aware of unsafe practices, but afraid to report internally, despite referring to their workplace as ‘the well from hell’. When they did voice concerns, it was met with a complacent response, fuelling an apathy towards safety culture. Fully sharing critical near-miss incident information with everyone who needs to know is also fundamental to ensuring safe operations. The Deepwater Horizon crew clearly needed to know about the North Sea incident in similar circumstances, and to learn from the mistakes there. Confidential reporting acts as an additional line of defence where internal reporting systems fail to fully meet these two objectives. Where trust is in short supply, for whatever reason, confidential reporting can help facilitate the resolution of long-standing safety issues. Sharing the lessons learned from wider industry is critical for ensuring a more proactive safely culture prevails. 1. Anderson, J., Burkeen, A.D., Clark, D., Curtis, S, Jones, G., Kemp, R.W., Kleppinger, K.D., Manuel, B., Revette, D., Roshto, S., and Weise, A.P. in Deep Water: The Gulf Oil Disaster and the Future of Offshore Drilling. National Commission’s Final Report (p. ix 2011).